Back from Cree country. 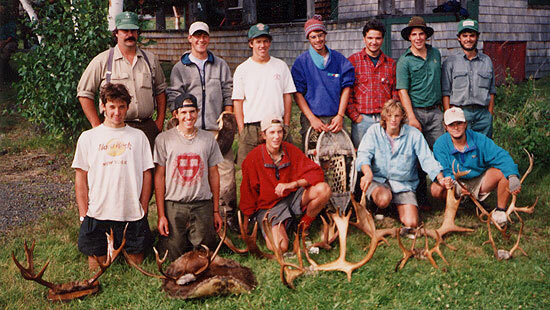 Left to right, back row: Steve Springgate (staffman), Nat Fogg, Cam Sterling, Ned Roberts, Mike "Madison" Warren, Wes Smedley, Bill Seeley (guide). Front row: Cy Prothro, Dan van Neirop, Alex "Perky" Perkins, Whit Shonk, Steve LeBoutillier. Dinner on the "Moon River." We took the same route in both '91 and '92, each time trying to reach the upper Eastmain via Lake Hecla, but running out of time on account of sleepy days caused by cold, cold, cold rain. One of Steve's tactics was to watch me run a rapids, and then, weigh whether or not he wanted to follow me with the lads. There is a rapids just above Némescau that always gave Steve a story for the final campfire. It had rained and rained the night before and the weather was no better when we reached the rapids. 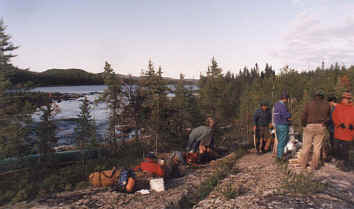 The campsite we were trying to reach was just below the rapids, a large, empty, Cree, sturgeon fishing camp* a half-day paddle above the village. Well, this time Steve didn't wait, but took second slot so there would be two of us downstream in case someone to a late afternoon dip. Off we went, paddling straight out into the swift current. Once through the steepest of the haystacks, I turned around to see how the lads were faring, just in time to see Steve take a wave across the left cheek (honestly, the wave was tall enough to crash across his face), as if the river were challenging him to a duel. We made an offering of extra large pieces of bacon the next morning to the Bear and the Loon. * It is a camp at the first set of sandy shoals above Némescau. There are two wall tents, two domed skogans, a bunch of cleaning tables and drying racks, and a large smoking teepee there. It is a clearing 50 yards by 30 yards. Offshore are set spruce poles for attaching the nets across the current. I would guess they hunt from here in the fall as well, but there are "sturgeon camps" like this all along the shallow braids of the river above Lake Nemesca. Some of them had been winterized between 1993 and 1998 as year-round trappers cabins (but not the one we used). A skogan (skagin?) is a house. We call the domed frames skogans and the others wall tents, but I take it that they are all skogans. On the Tichegami and Eastmain they get pretty elaborate, maybe several in a row, extending back from the river. There is currently big, long-house skogan up at Smokey Hill Rapids. On our first night on the Rupert, we camped on a cramped, dark site. Those Timberlines are nice but they don't have the headroom of the Cadillac of tents – those old, canvas, Woods tents – especially with a big staffman. I woke up in the middle of the night. Everything was black as pitch and I couldn't move. There was a snoring sound and a heavy weight pinned me to the ground. It took a moment of panic before I realized I was under Steve. I pushed him off, and in a moment of clarity knew what it must be like to be buried alive. I spent the next half hour under the fly listening to the rain, while trying to gather the courage to return to the downhill side of the tent. That was the genesis of our "guide gets the uphill side" rule.